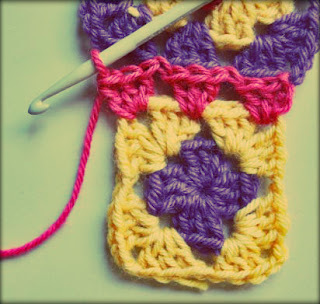 The good news is that I’ve prepared a step-by-step crochet tutorial for you! 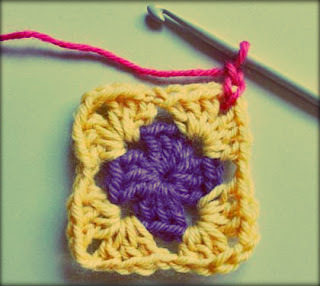 It is about joining crochet granny squares without any sewing involved. 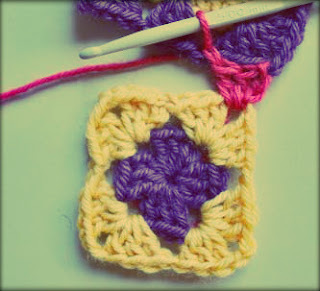 This is my favorite way because it is easy and no one can tell that those granny squares were ever apart before. You see the two squares below? Perfectly joined. You need no extra yarn and no needles. Want to know how? Lets get started! 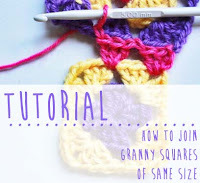 First thing you need to take into account with this technique is that to join two squares of same sizes you will start off with two squares of different sizes. WHAT? Ok. Here’s the thing. 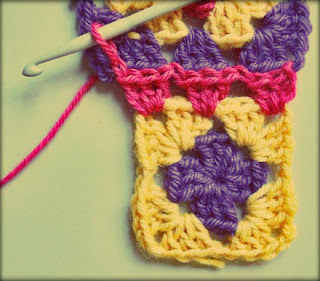 With this technique, you will join the squares while you are completing the last row of one of the squares. This will make much more sense once we go through all the steps. 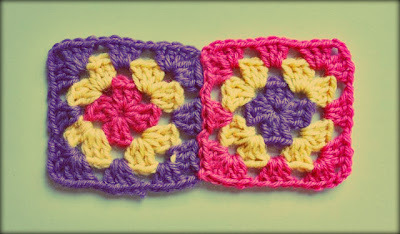 In this example I will start with one square with three rows (left) and another square with only two rows (right). 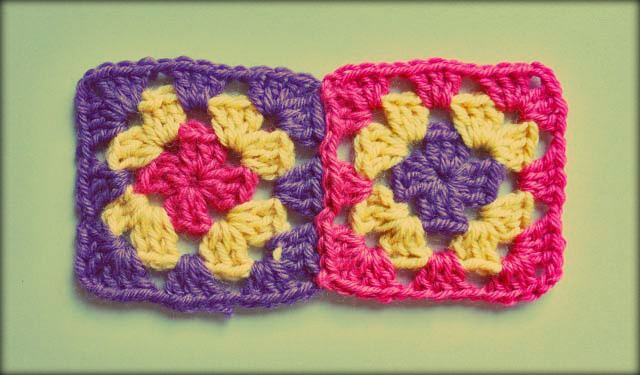 What I want to do is add a pink row to the right handside square at the same time that I join it to the left handside square. 1. 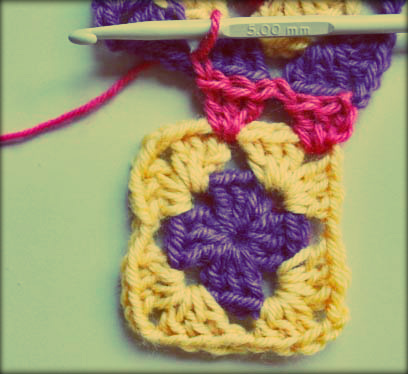 Starting with the small square, insert the hook in one of the corners and do 2 chains. 2. 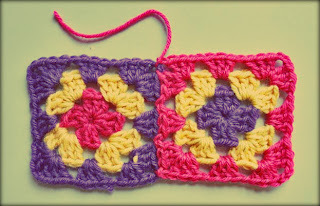 Grab the other square and do a third chain around the corner of this square. See the picture below? 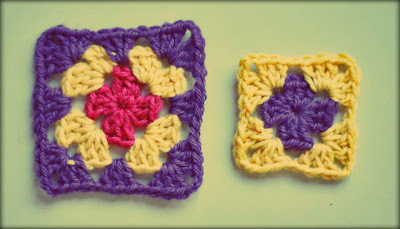 Our two squares are now joined! 5. 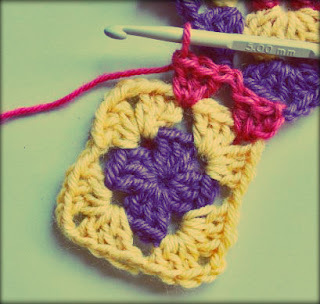 Continue with three single double stitches. 6. 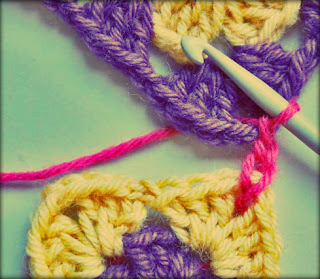 Again, do a single chain around the second single chain from the second square. 7. Continue with another three single double crochet stitches. 8. Do a last single stitch around the corner of the second square. Now do another chain, three single double stitches (that will be the corner of the square)… and continue with the row all around the square. Great tutorial: you make easy what seems tough for us!. Cheers! A ver, por partes! LO primero en Mallorca hemos hecho un club de chicas creativas y el domingo 14 de octubre doy una master class de ganchillo para principiantes….y da la casualidad que muchas me han pedido hacer fundas para sus tazas de té. Así que les hare fotos a todas a ver si alguna cae ganadora de tu concurso o por lo menos telleno el mail con fotos de tu patrón …porque claro le daré tu patrón para que lo hagan. ¿Qué te parece? ¿chachi,no? Y por otro lado felicitarte por als fotos de tu tutorial, son super chulas y muy practicas. Marta, nice to meet you in our kdada!!! Me ha encantado el tutorial!!! 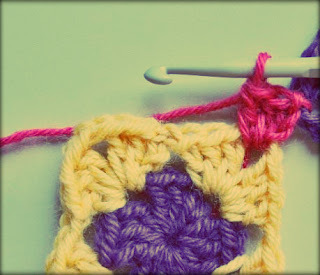 es mas… lo estoy utilizando en un cuello que he hecho con grannys cuando lo tenga terminado colgaré unas fotos para que lo veas!! hugs and kisses OOOXXXX. We will be in touch!! ¡Que ilusión yo! no habia visto la contestación!! Ahora mismo he enviado el link a una amiga y lo he visto!!! Hemos montado un grupo aqui en la Sierra Norte, nos llamamos “Tejeriles” estamos en facebook. Cuando vengas a Madrid ven a vernos!!! Nos reunimos todos los miércoles por la mañana en el Centro Cultural de La Cabrera. El cuello ha quedado precioso pero… sabes que lo he regalado sin hacerle ninguna foto? Pues voy a tener que visitar a mi amiga para hacerle la foto y colgartela como prometido. Muitos beijos para voce também!!! e um grande abraço!! Beijão muito grande para você!! Muy bueno!! me gustaria que pudieras publicar la continuacion de este tuto.